This last week while revisiting John C. Hudson’s 1976 article, “Migration to an American Frontier” in Annals of the Association of American Geographers, Vol. 66, No. 2, pp. 242-265, I came across this photo of German-Russian vernacular architecture. 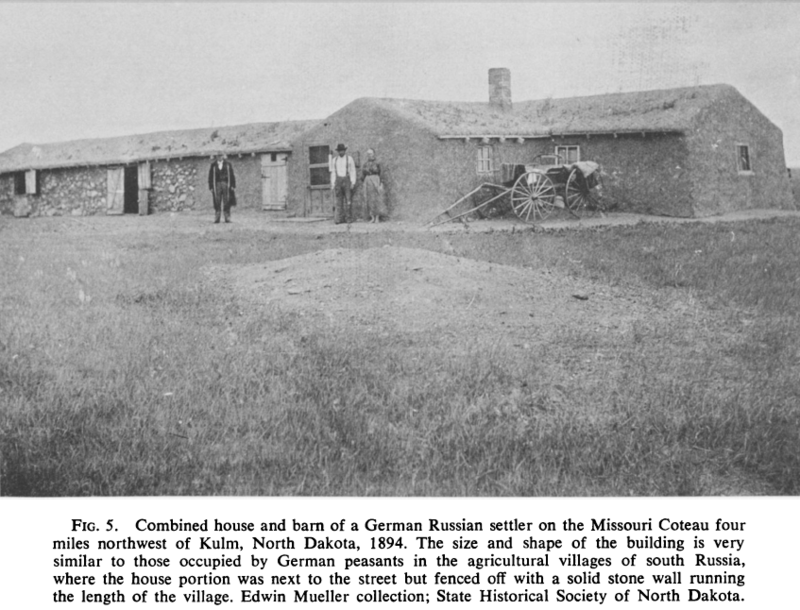 As the caption says, this is from 1894, taken right around Kulm, LaMoure County, North Dakota — the county just east of Emmons County, where the Welk German-Russian homestead is located (recent articles on that here, here, and here). The Welk homestead, in turn, is just down the road from Braddock, Emmons County, North Dakota, where my great grandfather Barth homesteaded and farmed. Barth was an Ohio-German imbedded amongst the German-Russians, something not as difficult to pull off as it might sound. 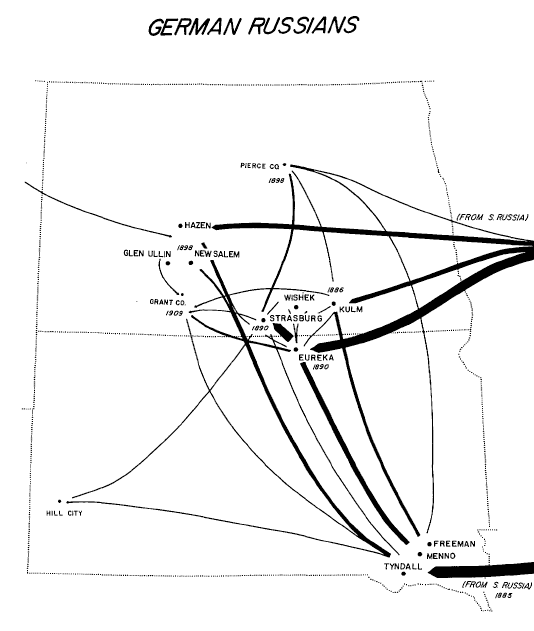 Anyhow, below is also a map of the German-Russian migration to the Dakotas, at least as it played out just before and after the turn of the 19th century. This entry was posted on Tuesday, January 21st, 2014 at 12:00 pm	and tagged with Dakota Territory, German-Russian, Kulm, North Dakota, North Dakota State University, South Dakota, Welk Homestead and posted in Uncategorized. You can follow any responses to this entry through the RSS 2.0 feed. I loved your migration map and wondered if you had any information on how they cross the country to get to, say Eureka. I know they took the train from New York, but does anyone know the route? Thanks.